The purpose of the sauna is to relax the muscles after intensive massage, but also to release through the pores toxins broken up by the bodywork. Sweating is one of the body's natural purification methods and the Thais have traditionally used herbs in the sauna to assist in this process. The classic recipe for a Thai sauna is the same as the recipe for the herbal compresses, although many different aromatic herbs may be added to achieve particular purposes or to address particular needs. In fusion in hot water for steam: The steam will be absorbed by the skin and inhaled to drive out the toxins from the body via respiration. 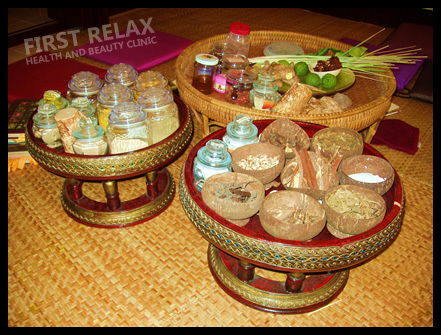 Traditional Thai herbal steam therapy is one of the most efficient methods of ridding the body of toxic wastes through the skin and lungs. The highly aromatic medicinal herbs quickly absorb into the bloodstream and circulate directly into every tissue of the body, delivering their therapeutic powers to each and every cell. At the same time, the hot steam opens the pores and allows the herbal vapours to enter the skin to draw out toxins with the sweat. The herbal steam simultaneously cleanses the body from the inside and the outside, providing a doubly detoxifying effect as well as a very relaxing, soothing experience. More than 70 different aromatic herbs can be used, but the primary ones are lemon grass, kaffir lime, ginger root, galangal root, basil, cinnamon, rosemary, thyme, pepper and mint. We also use herbs from other regions of the world, known for their cleansing, relaxing and rejuvenating properties such as lavender, lemon balm and sage. Water therapies found in Thai spas include traditional as well as Western methods. The unmistakable bouquet of the traditional Thai herbal steam may be found all over the country. Commonly used herbs such as lemon grass, galangal or ginger root, kaffir lime leaf, basil or camphor were traditionally boiled in a pot which was placed in a makeshift tent. The fresh scent of the herbs in the resulting steam was inhaled, improving blood circulation and cleansing the skin. Today Thai herbal steam rooms range from traditional-style tent arrangements to sophisticated steam rooms. Thai herbal baths use similar herbs to those used for steam, bruised in a mortar, placed in a cloth bag and soaked in the bath. The effect is calming and uplifting, providing welcome relief for overworked muscles or irritated skin. 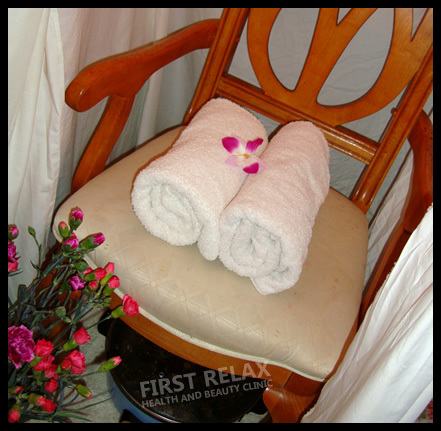 Includes 60mins full body Swedish massage or Aromatherapy massage and 30mins of Thai Herbal steam bath, a total of 90 mins.